In Malak Helmys videos, sculptures and text pieces we encounter a strange and poetic world of material desire and contagious transformations. A pixel dreams of becoming a particle of dust, carbon wants to be diamond, and states of excitement move infectiously from mannequins to edifices, to humans, to images. 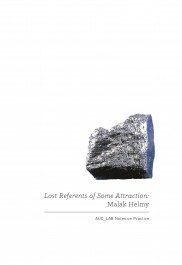 This book brings together writings and images to explore Helmys work - its mutations of empathetic exchange meandering between presence and absence, text and image, index and event. Helmy was born in Alexandria and is based in Cairo. Her work has been shown at the Berlinale Forum Expanded, the 9th Mercosul Biennial, Camera Austria, 9th Gwangju Biennial, and Documenta 13s Cairo Seminar, among others. In March 2014, she presented Lost Referents Of Some Attraction in the Sharjah Art Gallery at the American University in Cairo. This book is conceived in parallel with that exhibition, and is the first number in AUC_LAB Notes on Practice, a new series of publications focusing on contemporary art in Egypt produced in relation to the exhibition program of the Sharjah Art Gallery of the American University in Cairo.